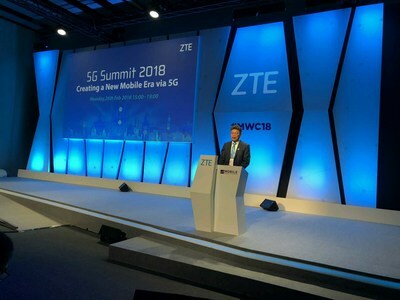 SHENZHEN, China, Feb. 26, 2018 /PRNewswire/ — ZTE Corporation (0763.HK / 000063.SZ), a major international provider of telecommunications, enterprise and consumer technology solutions for the Mobile Internet, co-hosted with GSMA the 5G Summit 2018 – Creating a New Mobile Era via 5G at Mobile World Congress 2018 in Barcelona, Spain. The summit gathered over 200 executives and representatives from world renowned telecom operators, chip makers, and tech companies to discuss how to build a smarter and connected world. Houlin Zhao, Security-General of ITU, stated that 5G was a key to the realization of United Nation’s Sustainable Development Plan. As the UN of the ICT industry, ITU has a mission to ensure that all people can share and exchange information anytime and anywhere. ITU is accelerating the advent of a 5G digital era. Dr. Zhengmao Li, Vice President of China Mobile, shared China Mobile’s efforts toward large-scale 5G commercial deployments by 2020. China Mobile has performed excellently in key technology R&D, international standardization, industry maturity advancement, and cross-industry ecosystem development. It will continue to strengthen 5G end-to-end development to make 5G a commercial reality. Yogeth Malik, VEON’s CTO, talked about VEON’s vision of virtualization. VEON’s clear path to 5G Common Core will enable all types of network access and digital transformation. Experts from top chip makers like Qualcomm and Intel indicated that 5G would be the future and 5G commercialization is coming. They believe that end-to-end commercial 5G solutions can only be achieved through cross-field collaboration and 5GAA demonstrated that. An expert from Baidu illustrated how 5G could realize driverless cars, where 5G high-speed data rates, low latency, and high capacity played a vital role. 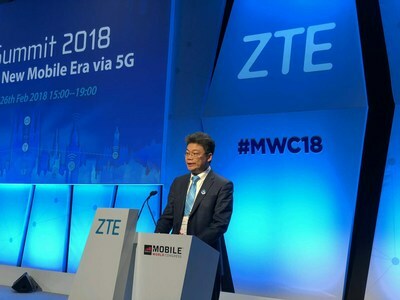 Dr. Jiying Xiang, Chief Scientist of ZTE, delivered a keynote speech – 5G is Coming. As per his viewpoint, 5G will be a network to ultimate user experiences and to bring the Internet of Everything with ultra-high data rates, ultra-low latency, massive connectivity, and ultra reliability. ZTE has completed the world’s first IoDT based on 3GPP standard in association with China Mobile and Qualcomm. In addition, the company has launched 5G product portfolios including mmWave and sub-6GHz 5G NR products, Flexhaul, and 5G core, and is well prepared for 5G commercial deployments.